Dubai, UAE, March 28, 2019: In 2018, the iconic Seamaster Diver 300M collection was reborn with a dynamic new look and technical standard. Now, OMEGA is proudly welcoming a new Limited Edition model that carries that same design excellence as well as an important link to the past. It was the original Seamaster Diver 300M in 1993 that introduced the unique metal known as tantalum. Most commonly used in electronics and medical equipment, tantalum is a lustrous blue-grey metal that is more rare than gold, harder than steel, and highly corrosion-resistant. It is also particularly difficult to work with, adding to its rare use within the watch industry. The distinctive colour of tantalum worked perfectly within the revolutionary Seamaster Diver 300M watch design and became a popular attribute of that original release. 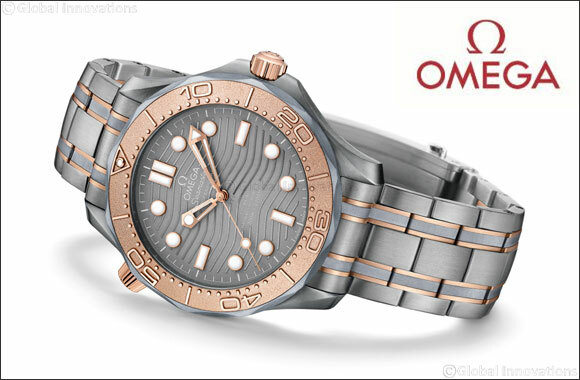 Today, OMEGA has reintroduced the metal for this special model limited to 2,500 pieces. Sized at 42 mm, the new watch includes a brushed case and bracelet built from grade 2 titanium. In subtle contrast, the blue-grey tone of tantalum has been used for the base of the bezel, as well as in the middle links of the bracelet. The Limited Edition model also includes bold touches of 18K Sedna™ gold. This can be found on the crown, bezel ring, conical helium escape valve, bracelet links, indexes and hands. There is also an 18K Sedna™ gold plaque on the side of the case, which is engraved with each Limited Edition number. Looking from the front, wearers can appreciate the grey titanium dial with its raised machine-engraved waves, which were another emblematic feature of the original Diver 300M models. Turning the timepiece over reveals a transparent caseback, featuring engraved wording and an image of the OMEGA Seahorse - which are all kept in perfect position thanks to OMEGA’s NAIAD Lock system. Through the sapphire-crystal, you can see the Master Chronometer movement 8806, certified by the Swiss Federal Institute of Metrology (METAS) at the industry’s highest standard of precision, performance and magnetic resistance.